As I’ve documented on this site over the years, I’ve been on a quest to find the perfect ultralight writing solution. I’ve tried tablets, Chromebooks, and Surfaces, but every solution came with its own set of compromises. 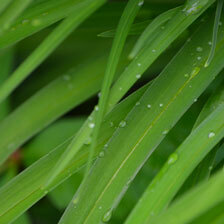 The Surface 3 was my most recent, and most successful to date, attempt. It was ultra-light, could run Final Draft and Word, and was within my sub-1000 price range. However, over the years, the weaknesses of the Surface 3 began to nag me. It wouldn’t reliably connect to a hotspot (mostly a fault of my iPhone and the terrible drivers Apple includes with the Windows version of iTunes), and the processor was painfully slow. Also, I had problems with the tablet randomly dying on me during important meetings, often due to Windows 10 attempting to update at the least opportune time. For many years I’ve had an eye on the 11 inch Macbook Air, but the screen was (and still is) a disappointment. The screen felt cramped, and it was a low resolution TN panel. I use a 15-inch Macbook Pro for work, which I’ve always enjoyed, but its far too big and heavy to be a carry-all-the-time computing device. 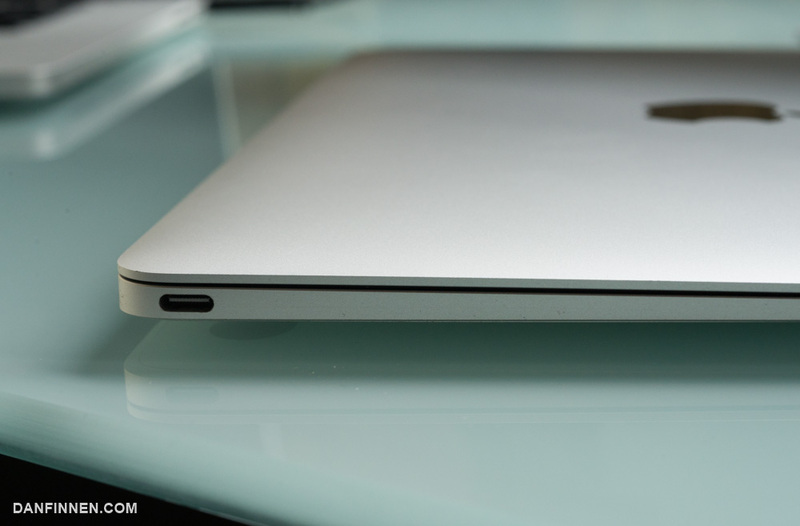 When the 12-inch Macbook came out in 2015, it seemed to be an answer to all my prayers. An ultralight, tiny Macbook with a high quality, high density screen? It seemed perfect – with one exception: the massive pricetag. This machine started out at 1300 USD and went up from there. Fortune smiled upon me this summer when a friend of mine offered to sell his nearly-brand-new second-generation Macbook to me at a price I could actually afford. The ‘Early 2016’ version is still sold by Apple new as of February 2017, so I thought I’d write up a little review for any writers out there who are considering one. So long, rambling introduction aside, how does the Macbook stack up as a go-with-you-everywhere writing companion? Long story short, this is as good as it gets when it comes to a secondary travel computer. However, the things that make it great for travel make it a miserable primary machine. 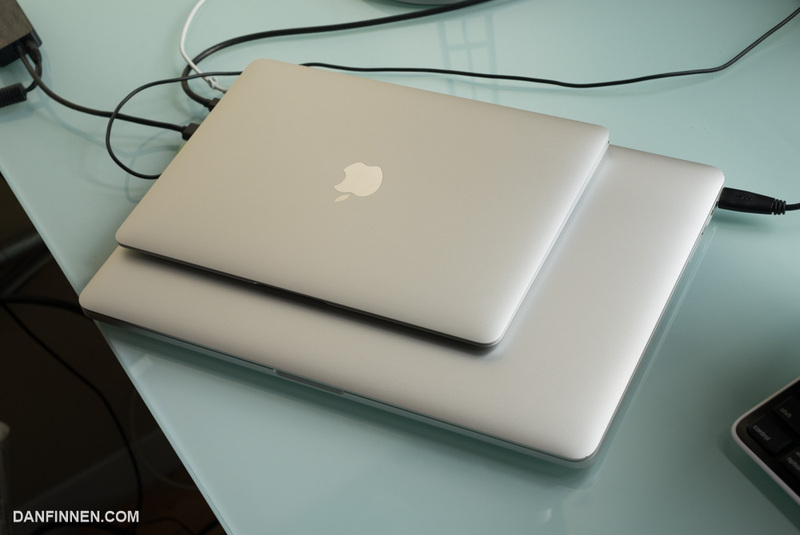 The Macbook sits on top of my 2013 Macbook Pro, which actually has the ports and power to get some serious work done. Laptops are always an exercise in trade-offs, depending on what your priority is. When the Macbook was designed, the number one priority was certainly portability. This machine absolutely excels when it comes to moving around. You have to see it in person to really appreciate how damn small they made this thing. I remember being blown away by the Macbook Air years ago, but this makes the Airs seem chunky by comparison. Closed, this machine takes up almost the same real estate as my Surface 3, which feels far more cramped. Battery life is incredible, lasting me for days when I’m only using the computer for a few hours here and there. The components are fanless, so it never gets hot or loud, even under heavy load. As a connoisseur of keyboards, I was curious about the ultra-low travel keys Apple designed for the Macbook. 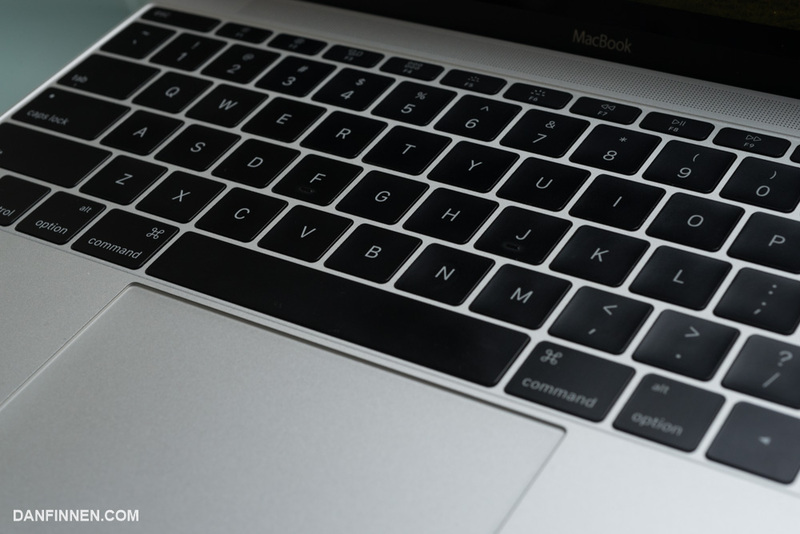 For those who haven’t gotten a chance to use one yet, the Macbook and new Macbook Pros all use keyboards that have keys that barely move. This is supposedly a move to make the computer thinner, but seems more like change for the heck of it. Regardless, I’ve grown to not mind it much. It’s by far the shallowest keyboard I’ve used, but the switches are nice and clicky, and the keys are not likely to trigger accidental presses. I think I’m more prone to typos and errors when typing quickly on this board than other keyboards, including Apple’s previous generation keyboard, but it’s not a big enough of a problem to be a deal-breaker. Like many mechanical keyboards, it’s also just kind of… fun? The keys have such a satisfying click that my older Macbook Pro’s keys feel sort of mushy by comparison (even though I type much more accurately on that board). My only complaint is that the backlighting in the keys is kind of uneven on any keys with words. All the details on this machine are so attended to that this one being overlooked is kind of strange. The same problem appears on the new Macbook Pros, so it seems Apple has thrown its hands up about the problem for the time being. 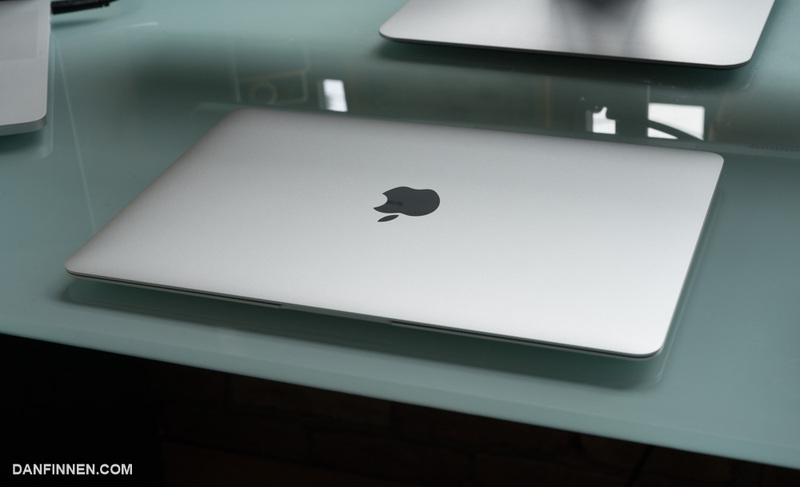 Apple keeps outdoing itself with trackpads, and the Macbook is no exception. Using the weird ‘force touch’ haptic feedback engine, it still feels like you’re clicking on something when you press down even though there’s no actual button anymore. It works great, and I rarely miss using a mouse outside of games. Speaker quality is fantastic. I would say its even better than my 2013-era Macbook Pro, which I thought was pretty decent. The fact that something this small can sound great is impressive. The Surface 3 also had great speakers, so I hope this trend is here to stay. I really, really miss Magsafe here. Fingers crossed that this port proves durable. One of the most controversial aspects of this machine is the single USB-C port, and rightfully so. It’s what drove my friend so crazy he sold the nearly brand-new computer to me at a discounted price. Nearly two years after it’s initial release, people are still surprised when they see the single port. Yes, there’s only one port, and that includes charging. There’s also a headphone jack, because Apple has no idea what its doing when it comes to port standards across its products. You can use dongles (adapters) to plug stuff in, but years after the introduction of this computer, even the best are still finicky. They generally work if you only want to plug one thing in at a time, but what if you want to charge your phone, the computer, and plug in a memory card? You… can’t. Even high quality usb-c splitters with multiple USB type A ports stop working properly when two or more peripherals are plugged in. None of this bothers me, as I have other machines to do that work with. But many people only want to own one computer, especially if it costs 1300 USD. Unfortunately, for most creative professionals, and really, anybody who has a digital camera other than their smartphone, the Macbook is not your answer. Especially with the 2015 version of this computer, there was quite a bit of hand wringing about the speed of the Macbook. I’m happy to report that the early 2016 model is actually quite speedy. In fact, it’s way faster than what the 1.1Ghz specs would lead one to think. For the record, I have the baseline model 1.1 GHz Core m3 with 8 gb LPDDR3 memory and Intel integrated graphics. My biggest concern before buying was that this computer would suffer from the same speed issues as my Surface 3, as technically the speed was lower and it had even fewer cores than the Surface 3 processor. However, it’s fast! I’m consistently shocked by how fast it is. Programs boot quickly, web browsing is painless, and the general experience is equal to my Macbook Pro 15 inch with a quad core i7 and dedicated GPU. The turbo really works, and the passive cooling system seems to work wonders. Yes But Can the Macbook Game? Yes… and no, not really. The Macbook can handle non-3D tasks like HD video playback no problem, and 2D games like FTL work great, but anything remotely intensive when it comes to 3D isn’t going to work great. Starcraft II is my typical benchmark, as it can scale from the weakest machines to 4K powerhouses pretty well. Starcraft on the 2016 Macbook isn’t pretty. It runs, but at the barest of settings, and nowhere even remotely close to the native resolution of the screen. 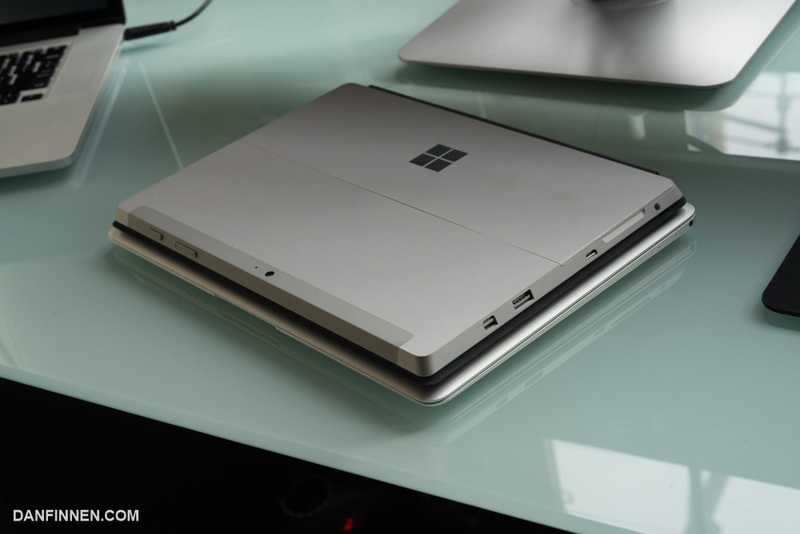 The Macbook is almost the same size as the Surface 3, but has a bigger screen and trackpad. It’s also way faster. However, the Surface 3 actually has a proper USB port to work with. 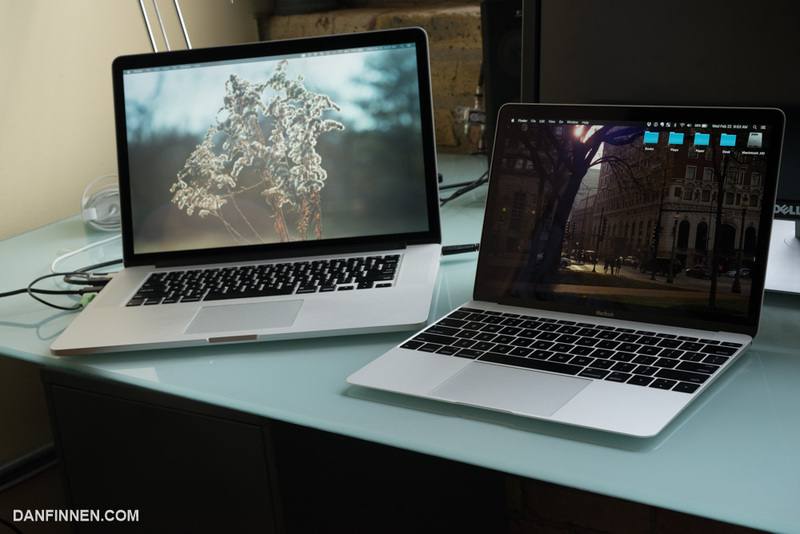 Apple has done a great job of making iPhones and Macs play nice together, and the Macbook is no exception. Being able to use iMessage and start up tethering without touching the phone itself is wonderful. I long to switch back to Android, but the convenience factor of iMessage on the computer alone is enough to keep me in this beautiful Apple prison. Apple may want people to use the iPad as an entry level machine, but if you’re a writer, you’re far, far better off with using a full-featured OS like MacOS or Windows. I’ve used plenty of tablets for word processing, and it’s just a world of compromises, whereas older operating systems allow me to just get stuff done and out of the way. It’s easier to bounce between multiple programs like Evernote and Word and divy up the screen between different windows in something like MacOS or Windows. Also, programs like Final Draft work great on Macs. Finally, nothing beats the trackpad for accurately navigating and editing text. The keyboards that Apple sells for its iPads lack any sort of trackpad, which means you’re poking at your screen whenever you need to fix a typo, something that slows me down considerably. The Surface 3 was great because it just got out of my way by providing full Windows. The Macbook has the same virtue with MacOS and works a thousand times better. Using this machine, it definitely feels like this is what Apple envisions becoming its mainstream Mac in the future. Rather than compromise in any way, however, they have priced it out of consideration for most consumers. While the Mac ecosystem continues to frustrate the hell of out me with achingly slow hardware cycles and a desperately fragmented family, I still love using MacOS/OSX. The Macbook is a great showcase for all its virtues and problems. If price isn’t a concern, I believe the Macbook is the best laptop on the market as a take-it-with-you everywhere writing computer. It won’t be your only computer, but that’s the way it works best. You can get the Macbook on Apple’s site or Amazon. Using these links help me keep this site running and cost you nothing. Thanks!